James Joyce ULYSSES London John Lane the Bodley Head 1937 1st Edition Thus 1st U. Trade Edition 8vo 8" - 9" tall Hardcover Book condition is Very Good+, bound in a fine moroccan leather, with five raised bands on the spine. Owner name to top corner of front end page. Text is clean and unmarked. Signed by the author, James Joyce, on a plate attached to the title page. Store for our complete inventory of Rare, Collectible and otherwise worthwhile titles. Feel free to reach out with any questions. 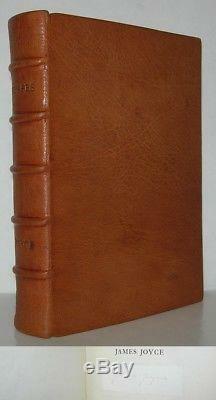 The item "ULYSSES James Joyce First Edition Thus 1st U. Trade Edition Signed" is in sale since Monday, January 1, 2018. This item is in the category "Books\Antiquarian & Collectible". The seller is "evolvinglensbookseller33" and is located in Croton-on-Hudson, New York.